Martin Luther King with leaders at the March on Washington, 1963. Peaceful protest is not easy but it’s crucial to do. In the last few years, police brutality against minorities in the US has come to dominate current events. This week alone saw the shooting deaths of Alton Sterling and Philando Castile. The death of Trayvon Martin spawned the Black Lives Matter movement, which grew to prominence as more names were added to the list of black men dying at hands of people in law enforcement: Freddy Gray, Michael Brown, and Eric Garner, just to name a few. Each of these incidents sparked protests in cities across the United States — some were more peaceful than others, but all had the same agenda: to make the issue of racism more apparent in the national conversation. One person who led a similar charge during another period of civil rights momentum in America is Martin Luther King Jr. He championed a form of civil disobedience and peaceful protest that eventually helped to secure civil rights for black people in the US. 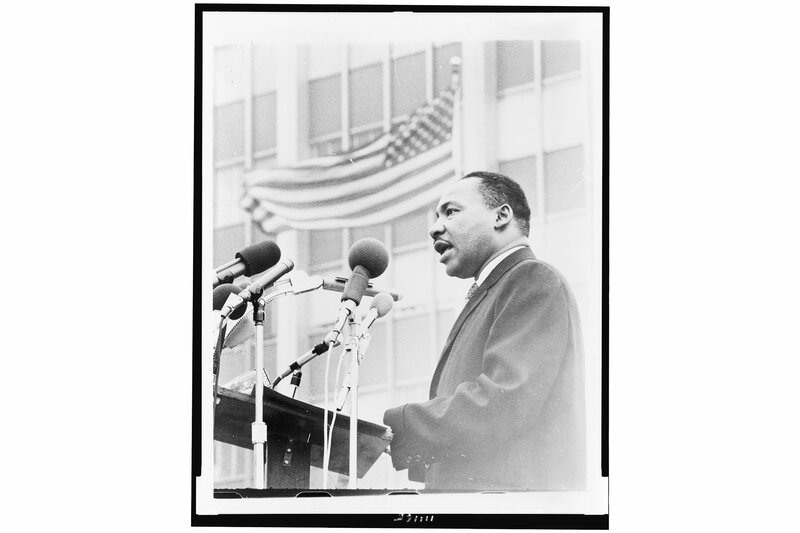 Martin Luther King, Jr., speaks at a demonstration in New York City. To King, peaceful protest did not mean meekly standing still or walking down a street, doing your best to avoid hurting other people’s feelings. Instead, peaceful protest meant facing serious risk and almost always causing tension by challenging the status quo. Peaceful protesters during the civil rights era dismantled part of the institutional racism in the US by insisting, day after day, on its injustice. These same protesters were also regularly assaulted by mobs, attacked by police batons and dogs, beaten in all sorts of ways, viciously harassed and pressured to give up. But they persevered. Throughout, King was adamant about one thing: never resort to violence because it would only beget more violence and be used afterwards as a tool to delegitimize the movement. So against endless provocations, King and millions of other protesters remained steadfast in their peacefulness. In the winter of 1955, Rosa Parks refused to move from her seat on a segregated bus in Montgomery, Ala. She was forcibly removed, which set off a massive boycott of the city’s public transportation led by King. Within months, the city was struggling financially and retaliations, including a firebomb on King’s home, began to take place. Eventually, the issue wound its way to a federal court which ruled that the segregation of public transportation was unconstitutional. This was then affirmed by the Supreme Court. To end discriminatory economic policies in Birmingham, such as refusing to hire black people or forcing black people to use segregated restrooms, King called for sit-ins and marches. His intent was to overwhelm the jails, causing chaos that the city would be unable to handle. As protests were held, black people were abused and ostracized. After about two months, the city conceded to the protesters and many of the hateful policies of local businesses were repealed. Even today, there are huge disparities in opportunity between black people and white people. In the 1960s these disparities were even worse. It was obvious to Martin Luther King Jr. that this economic exclusion was destructive to the black community and so he organized one of the largest marches in US history. The March on Washington for Jobs and Freedom attracted hundreds of thousands of people and it was here that King delivered his famous “I Have a Dream” speech. The speech and the march helped to make this issue a part of the national conversation and undoubtedly influenced the passage of the later civil rights bill. King’s compassion was all-encompassing. He was concerned not just with the liberation of black people in the US, but with people everywhere. King knew that his speech would cost him many allies, but his vision wouldn’t allow him to compromise on justice. Ultimately, King’s words became a driving force behind the movement to withdraw from the war. Recently, peaceful protests have erupted around the country after the murders of two black men, Alton Sterling and Philando Castile. During one peaceful protest in Dallas, an unaffiliated gunman killed 5 police officers and wounded 6 others as well as a civilian. It’s important to not conflate the protests with the slaughter of the police. The peaceful protesters did not allow this to happen and they, too, are horrified and saddened by it. It’s also crucial to remember that the most effective form of protesting is peaceful. In the weeks and months ahead, the country must work to heal both wounds by coming together and rejecting all forms of violence.